JDP offers a complete range of precast concrete rings from DN 900 to DN 4000 in varying depths with tongue and groove joints manufactured to meet Design Chemical Class 4 as defined in BRE Special digest 1 'Concrete in aggressive ground' Part 4 : Design guides for specific precast products’. Manufacturers Quality Assurance scheme in accordance with the European Standard enabling products in the range DN 900-3000 to be kitemarked. * Not Kitemarked, but comply with all the relevant provisions of the European Standard. DN 4000 is supplied in 2 halves. A constructed precast concrete manhole is a strong, durable structure with its own inherent strength and does not require a concrete surround. Polypropylene coated mild steel double steps to BS EN 13101 are fitted to manhole sections when required. Stainless steel steps available upon request. Consult the table below to consider the recommended minimum chamber diameters to suit the pipe size. For non-man entry chambers see JDP's AXEDO® range. Standard reducing slabs are available and supplied to suit the various chamber sections, from DN 1050 to DN 3000, and have a 900, 1050 or 1200mm diameter circular access. DN 3660 and 4000 reducing slabs are also available but are not covered by the European Standard. 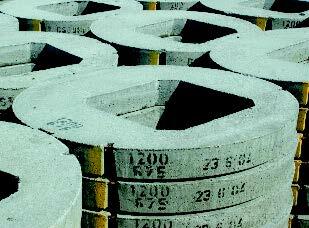 Landing slabs to suit DN 1500 chamber section and above can be supplied with a 900mm circular access. Reducing construction time and resources required on site is a continual challenge and opportunity to manufacturers and distributors. JDP strive to be involved in the latest advances in new and existing materials and technologies which offer engineers solutions. Preformed chambers provide a sealed system for waste water management in manhole construction, replacing the need for the groundworker to form on site. Can also be used for surface water. This chamber provides a sealed sump manhole which can be connected with adaptors to uPVC, twinwall, clay, ductile iron and concrete pipes.